For some years now, it has been possible to increasingly automate production processes, and by doing to to achieve substantial cost reductions in some cases. This raises the question: does it still make sense to use mechanical pressure measuring instruments? The answer to this question is obvious and simple: yes. Both electronic pressure sensors and mechanical pressure gauges have properties that must be weighed against each other in each application. The table below summaries the individual benefits. The biggest benefits of mechanical pressure gauges are the easy installation and good readability of the measured value. 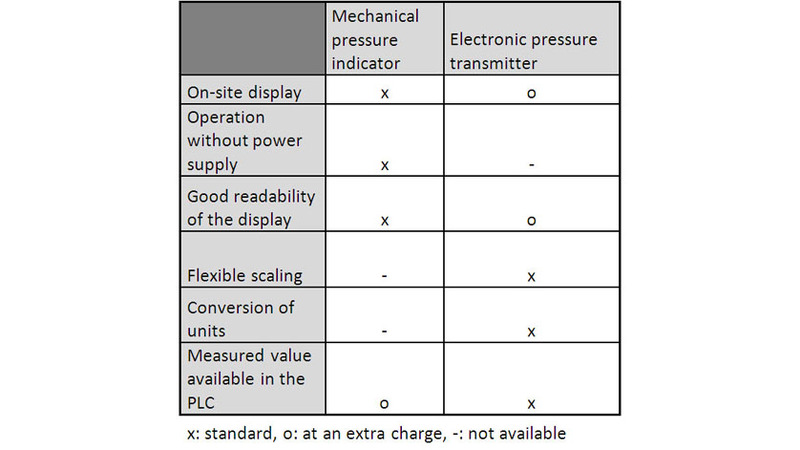 An electronic pressure transmitter can also be equipped with an on-site display, which is also easy to read even in darkness, but a pressure gauge offers better readability from a distance with a large scale and in daylight. Due to their robust mechanics mechanical pressure gaugesare mandatory in certain applications (e.g. hot-water tanks). A pressure gauge is quite often combined with a separate electronic pressure sensor. This combines the benefits of both systems: pressure measurement with local display without power supply and availability of a measured value in the PLC. For users who have only one pressure connection available, pressure gauges with integrated electronic sensor are also available.